Ever wonder how those beautifully imprinted, wafer thin cookies were made? It's easier than you think. So get ready to wow your friends. All you need to do is scoop a spoonful of batter (recipe booklet included) onto each round nonstick surface, close and latch the lid, and in only 60 seconds you'll have two perfect and pretty pizzelle. The press has a five-setting switch to adjust the temperature for browning preference, and red and green lights indicate readiness. Because the press has a quick reheat time, you'll be able to make dozens of pizzelle in no time. And from there, enticing possibilities abound. You can roll the warm pizzelle around a wooden dowel (included) to make cannoli, or shape them over an inverted custard cup to make a delectable dessert bowl. You can also simply let the pizelle cool, drizzle it with honey or syrup, and you've got a crisp, delicious cookie. The press is 9 x 8 x 4 inches and can be stored upright to save space. It's easy to clean. And, it comes with a three-year limited warranty. 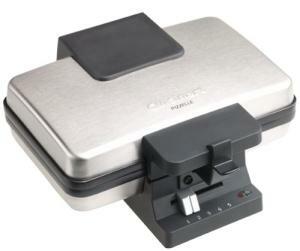 Plus, with Cuisinart's Pizzelle Press you are sure to make a good impression on friends, family, and co-workers.